The Western River guides that we had on our Grand Canyon trip had great personalities. 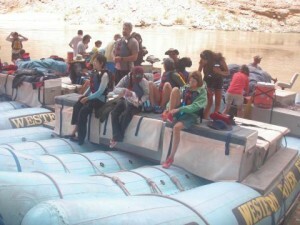 The "J" rig boats were strong and secure, and the Colorado River challenged us. The food was beyond any expectation, and a new surprise popped up at each breakfast and dinner. 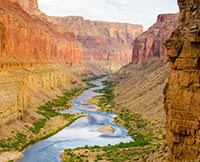 I learned a great deal from the guides about the geology of the Grand Canyon and those rafters who had gone before us. I will say that I was covered with the mud sediment by the end of the trip. Bar 10 Ranch shower was most pleasing.